I have another copy of Fancy Party Gowns by Deborah Blumenthal with illustrations by Laura Freeman to give away, and I'm going to offer it in honor of Women's History Month. Fancy Party Gowns is about Ann Cole Lowe, a mid-twentieth century African American dress designer who designed for wealthy white women. She was quite popular with them. Lowe has great significance in the history of her field. Her field involves sewing, traditional women's work. During Women's History Month I'm seeing all kinds of terrific material about women in science, the military, and technology. I'm seeing reports on women explorers and inventors. Ann Cole Lowe made clothes. And that's very important in terms of women's history, because Lowe wasn't the only woman who sewed over these last few hundred and maybe thousand years. Yes, she sewed particularly well, but in terms of women's history, as I said, in my mind, she represents something. She represents traditional women's work. In a big, spectacular way. Women kept humanity going with the traditional work they did to keep families functioning, to keep family members alive. They still do. When I was in college, I heard about a women's history library at what was then Radcliffe College. (The library is now the Schlesinger Library at the Radcliffe Institute for Advanced Study at Harvard University.) There were thousands of cookbooks there. Twenty thousand, it turns out, a fifth of the collection's 100,000 books. My first response when I learned about this was to get all holier-than-thou college student. Who did those private college people think they were, pigeonholing women as cooks? But somewhere along the line, I learned that cookbooks in days of old weren't just lists of ingredients and how to mix them together. The American Frugal Housewife by Mrs. Child, originally published in 1832, describes how to corn meat and includes a section on "remedies." "A rind of pork bound upon a wound," for instance, will prevent the lock-jaw, in case you ever need to know that. 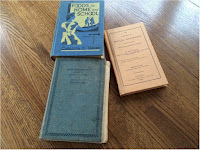 Even a twentieth century cookbook like Good Housekeeping's Book of Menus, Recipes, and Household Discoveries, originally published 1922, includes a year's worth of menus, three per day, and a section of household tips. 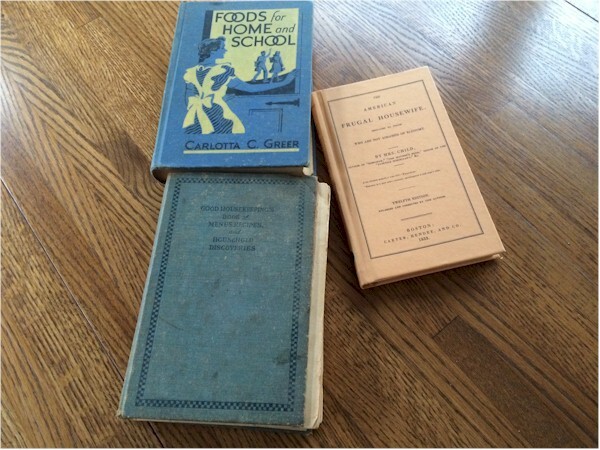 Cookbooks used to describe how people lived. They described what women did in particular times. When I realized that, I became more interested in cooking, as women's work, and in women's work, in general. Yes, historically women have been ignored for their work and contributions to NASA, paleontology, medical research, everything. But they've been ignored and even belittled for the work that was considered "their place," as well. How important was traditional women's work in, say, the American West or any frontier? I've read that the loss of a wife in those areas and times was a greater catastrophe than the loss of a husband. At least a woman with some money could hire a man to help with farm work. And, what's more, many women shared their husband's work on farms/ranches. They could at least milk a cow, take care of chickens and a garden and maybe do much more, if their husbands died. But where was a man with children to raise, feed, dress, on top of his traditional work going to get help, if his wife died? What was the likelihood that a man could do much of women's work, the way many women could do theirs? We hear about mail-order wives; we don't hear about mail-order husbands. 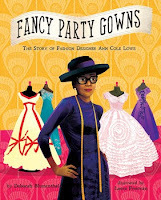 Your Chance To Own "Fancy Party Gowns"
You have a chance to win a copy of a book about a woman who excelled at a particular type of women's work, who, it could be said, raised it to an art form. Comment below, and at the end of the month, I'll draw the name of the person who gets my last copy of Fancy Party Gowns. Keep in mind, I'll need to get in touch with the winner. If the name next to your comment, doesn't link back to a blog or site so I can find an e-mail, I won't be able to reach you. Therefore, check back here at the beginning of April to see if you've won. Then you can contact me. I just read & loved this one, Gail! I'd love to win a copy :) Thank you for the chance!! And you've included a way for me to reach you, if you win! Hurray! A remarkable woman considering the times in which she lived and the clientele she served. Her career path wasn't typical one, either, for African-American women. Thank you for the link to contact info. DAughter is a designer, and I'd love to give this book to her! I think a lot of the picture book biographies I see would be great for home schoolers. And for adult readers.